Pediatric Dentistry: They Are Just Baby Teeth, Why Fix Them? Most babies get their first tooth around 6 or 7 months of age; usually the bottom front two incisors. Some kids are a little slower erupting the first tooth causing parental worry. It can be even around 12 months for the first one to poke through. Additional baby teeth will continue to come in till almost three years of age. There really is a lot of variability on the sequence. Don’t feel bad if your child does not get his teeth just like your neighbor’s baby or even his own twin sister. 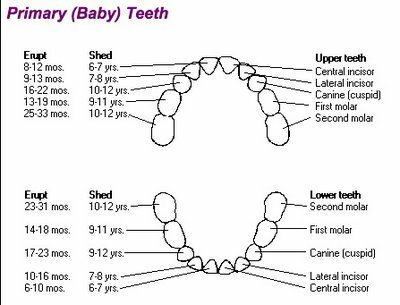 This is important: look at the chart below and you will see that some baby teeth START falling out around 5-6 years old (again give or take a little), but the back molars do not fall out till around 12 years of age! If your child develops a cavity in a baby tooth the decay will slowly (and sometimes rapidly) get bigger and deeper. If the tooth is really close to falling out, we have the option of just leaving it alone. If it looks like it may be a while till it would normally fall out, we need to do something. Otherwise you are in for ugly teeth, toothaches, infection and more extensive dental work. A small cavity can be filled with a white filling, a medium cavity can be filled, but a deep or large cavity may need a crown to cover the whole tooth. If the tooth is in the back, the crown may be silver in color. It may even need a Pulpotomy or “nerve treatment”. So, get it fixed early when it is small (and less expensive)! Remember baby teeth are there for a reason. They give the child something to chew with and (importantly) they often save space for the permanent teeth. Why don't you just pull it? Well, sometimes that is the best option, but if a back baby tooth is lost too early, without followup treatment, additional crowding problems that are often more difficult to correct will occur. So you usually will need additional work like a Space Maintainer. That's one reason why it's often easier to fix a baby tooth than just remove it. My child is 4 1/2 & she has 11 cavities. Obviously I have not done a great job up to now, though the hygenist said because her teeth are very close together, only flossing would have prevented the cavities. I am now flossing and doing a flouride rinse in addition to brushing w/Oral B rotating head brush. They want to take care of the cavities in 5 appointment: front teeth and then by quadrant. We basically have HMO type dental. Is this a normal number of appointments for such a young child to have to go through? My husband thinks it's excessive & I really don't know. Do all cavities need to be filled even if they are small? Or can better maintenance by me keep them from progressing and avoid the need for fillings in these baby teeth? I'm glad you commented, as you ask questions many parents ask. First, realize flossing does help, but I see kids/parents that brush and floss great and the kid still has problems with cavities. Those cavities in between are very hard to prevent especially if the kid is "prone" or vulnerable to getting cavities due to other factors, some of which we can't control. Although "weak spots" (the beginning of cavities) may remineralize with luck and usually not with baby molars, you have to remember that once a cavity starts it will get worse even with great brushing/flossing. Every day I see kids who look pretty good but x-rays reveal multiple cavities between the teeth (usually the back molars). Most four year olds do well for dental work, but they can't sit in the chair for long. So we usually break up the work into managable appointments. Also, if the areas are in different parts of the mouth and need to be numbed up, well you can't just load up multiple areas with anesthetic at one time, you have to watch the dosage. Sometimes you can do more work at one time with premedication or sedation because with the medicine, the child can tolarate longer appointments or we can work faster sometimes. These kids are really young, they are not adults. The only cavities I do not fill/fix are on teeth that are asymptomatic and will be falling out in a short time and are unlikely to become a problem. Somtimes they can just be removed if they become a problem before then, as it is close to the normal time they would fall out. 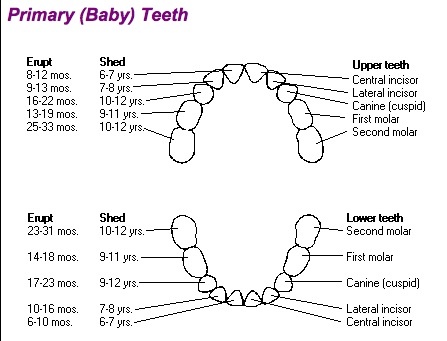 (See the chart-many teeth do not fall out till 12 years of age)! It is easier to fix a tooth with a small filling than a large cavity that requires a pulpotomy and a crown or even extraction due to abscess and a space maintainer. --and it isn't very long before you reach that point in many cases. -- Good luck, I hope things work out well for you. My soon to be 5-years old has two teeth growing behind front-center-bottom baby teeth. The baby teeth doesn't appear to be loose and he hasn't complained about being in pain. Should I have his baby teeth pulled? My son is 10 months old. He has recently just got his first tooth. It is his top right lateral incisor. Is this okay? I was always told that children get their top and bottom two teeth first. Sometimes I see baby teeth coming in in an odd order like you mentioned. A slightly out of the ordinary pattern is not unusual. In addition you can see there is a lot of overlap in the eruption chart above. By the way remember that a Child's First Dental Visit should be by about one year of age. I have a 16 month old with a cavity on his upper front tooth. It doesn't cause him any discomfort and my husband and I REALLY don't want to have him sedated in order to fill it. Are there any other options and is it absolutely necessary to have it filled at this time? Could we wait a couple of years until he would be more cooperative without sedation? Thank You! It is sometimes ok to wait a while due to a very young age. I don't like to sedate one year olds if at all possible. However, you can't wait too long as cavities get larger/deeper with time. 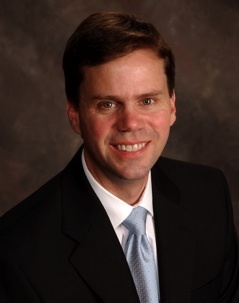 (you may have more extensive treatment needs if the cavity is much larger). Sometimes a small cavity needing just a filling can get so bad within one year that it needs to be removed. Ask your dentist if it's ok to wait and keep an eye one it for a while--that means regular checkups to have them take a look. Also, sometimes if it is very small and in the front it doesn't take long to just get it done quickly without sedation "hold and go" I call it--not much harder than cleaning the teeth. --depends on a lot of factors like your preference, doctors recommendation, and the depth/size of the cavity. I have a 3 3/4 daughter that took a fairly bad spill last week. She fractured one front tooth and the smaller tooth right beside it. The pediatric dentist recommends pulling both fractured teeth and suggests we pull the other front tooth. However, the third tooth is simply for "appearances". She made it clear that because that tooth is "bucked" it is going to look very awkward with only one tooth in the front. She did say she could do a fixed partial but I worry about so many things. How will we know when her permanent teeth are coming through? What if she has another accident - what damage will she do to her gums if the partial comes out? My biggest fear is speech [without three front teeth] and the fact that she is a thumb sucker. The dentist worries about the damage she will do with no teeth at all - she states the gums and permanent teeth will be impacted. Missing front baby tooth do not affect speech development. You may want to read also my post on fake baby teeth pedo partials. My granddaughter was 2 when a dentist pulled four of her front teeth, because of cavities, my daughter said that she was told they would grow back by the time she was 7 she will be 7 this year. Should she be concerned because there is no sign of any teeth growing back? Lots of variation when they come in, but 7-8 is normal. If you have an x-ray made, that will show how close they are. My son is going to be 12 years old in 4 months. He has a very small/ barely visible cavity (grey spot) on what I just found out to be a baby tooth. The dentist we went to, wanted me to pay $728 for sedation so he could fill the cavity and seal his molars. I said no, we used gas and sealed the cavity instead of filling it. The dentist did not tell me that the tooth was a baby tooth. I only found this out from the insurance company because they won't cover the sealant for a baby tooth. Why was this dentist so set on filling this tooth? I also had to pay $300 up front and they said they would refund what I didn't use. ($209 according to my insurance company) Did I pick the wrong dentist for my son to go to? This is the first time we have gone to this dentist and probably the last. I have never had to overpay up front like that before. I cannot comment on your specific case. I will say it is not uncommon to request a down payment prior to costly procedures. My daughter is turning 5 in a couple of weeks and her top front tooth just fell out. Isn't it too early for her teeth to start falling out? Should I be concerned? Some 5 year olds are loosing teeth. Still, I suggest getting a dentist to check it out. May want to read my other posts on this subject. My 4 year old son recently went in for his cleaning, and they found 2 cavities. Due to his young age, they referred us to a pediatric dentist, who found the 2 cavities, plus 2 others in between the teeth. The recommendation for him was 3 pulpotomies, and 3 crowns. Would we be able to do fillings instead, or are the crowns a must? Depends. Sometimes crowns are the best option. Check out my other posts on these and related topics. When my 8 month old son got his first tooth it looks grey and white. Is this normal or should something be done about it? When his second tooth came in it appears fine. Should I be worried? Might want to check out my posts on hypoplasia. I'd get it looked at. My 11 moths old baby got a cavity in her upper teeth .. i am very worried about this .. what is the earliest time we can do the filling ? otherwise will it affect the other tooth .. she has 8 teeths .. what are the ways to avoid getting it spread .. i am breastfeeding her .any suggestions ?? Treating young children is often difficult. At he same time it can be fairly easy as well especially if there is just a small area affected. Consult you dentist for advice on treatment choices. As you read, many baby teeth stay till 11-12 years of age. Limiting ad lib feeding and at night bottles, has been shown to help reduce caries. Consult your physician as well before limiting feedings at such a young age, however. My son is 11 months old..he has gotten his 2 top teeth first then the bottom.But the 2 top teeth have a greyish color to them,he has no pain or no trauma to the teeth.As they grow down they seem to be turning whiter.What could this be? I brush his teeth 2 times a day with oral b baby toothpase ,floride free and only drinks water.I was on no meds while I was pregnant either. I do not know, best to get the dentist to take a look--it's alright to bring them in this early. Pediatric dentists are especially skilled at recognizing problems at an early age. Sometimes it is just a little stain, sometimes other things. Crowns used on baby teeth are not the same as the cast crowns used on adults. They are usually one appointment things without impressions. My daughter is about to be 4 and has two cavities. We discovred them last year, but I didn't want to fill them because the pediatric dentist said he would have to sedate her with valium. I was not about to do this to my child. I took her to a family dentist who cleaned her teeth and suggested we get them filled, but again I was not going to sedate her like that. Now about 8 months later she still has two very large cavities. Is there any way to treat them now that she is a little bit older without drugs? Since they are so large now will she need a crown? They are her back molars, so they should be with her still a while. Now you see the dilemma of working on children--untreated problems get worse. You may want to read my posts on Sedation in Pediatric Dentistry, and Sedative Drugs used in Pediatric Dentistry Valium is a pretty mild drug. Some kids do not need anything or will mature with age. Different kids, different personalities and reactions too. With age can come an increased ability to undergo treatment and communicate with the dentist etc, but time also makes dental problems worse and treatment more extensive. 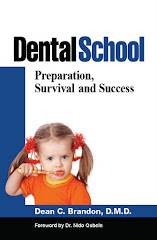 My post on How Children Behave at the Dentist, What to Expect might be helpful too. I've read through all the previous posts and I have a similar problem. My 4 year old had 8 cavities - 4 of which we've filled (in the molars). However, we now have to go back to have one between her top two teeth filled and two more between her teeth (canines, I think). I am concerned at the high cost of all this - I have been quoted $700 just for the top front two teeth - which is just a small decay on the front side where the teeth meet (they are very tight). How important is it to get these ones done since she is now 4 years and 8 months? Should I get a second opinion on the cost or is this reasonable? On fees, it's hard to say. Cost often depends on whether sedation or nitrous oxide is used or not, whether the cavity is large or small or if crowns are needed, pulpotomy or nerve treatments. Combinations of those would certainly up the cost. Also, were you live, etc. Keep in mind what you are paying for is mainly time and expertise. Not to make light, but dentistry is expensive--for instance physicians do not have to buy costly x-ray machines, they just send you somewhere else for that. Oh, the upper central incisors often fall out naturally around 7 to 8 years of age--canines around 12 years of age. we were just told by our family dentist that our 3 yr old has a cavity in his upper right molar and that he needs a crown, for which he will need to go a specialist and be sedated/anesthetized. My hsuband is very concerned about this and is hesistant- what are the risks? Check out my posts on these issues over there on the sidebar--lots on cavities sedation and behavior management. I just had a three year old in this am for a filling--no premedication m=needed, but most of the time I use some form of sedative medications. Like I said if you look carefully I think you will find lots of info over there that may address some of your concerns. Also ask your dentist. We have twins and one of the boys top front teeth (Central Incisor to his left our right) is growing very slowly, in fact it appears to be half the length of the other. They both emerged about the same time, I am concerned that the tooth will be shorter than the other as it appears to have started higher up in the gum and was wondering if this could affect the growth of the adult teeth also? You didn't say this was baby tooth or a permanent tooth coming in--but from your implication these children are very young and thiese are baby teeth erupting--can't really advise other than to say teeth sometimes come in very slowly--usually should be all the way in within a few months certainly 6 months from time of eruption. Sometimes pacifier or thumb habits keep a tooth from coming all the way down. Permanent teeth --pretty much the same thing. Complicating factors that might need to ba addressed is if there were extra teeth up there or something like that--can tell that usually with an x-ray when they are old enough. 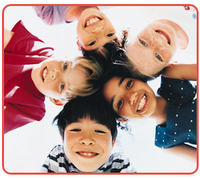 Get a Pediatric Dentist to take a look if your worries continue. My 5yr old had her first dental cleaning yesterday. She has a few small white spots on her teeth that we were told are "pre-cavities" The dentist told us to start using floride pills every night and make sure we help her brush 2ce a day. I am very conserned over these "white spots". If we do as they say to will they still get worse and turn into cavities? White spot lesions are kind of like pre cavities. It's sort of like a stack of ckoke cans at the grocery store, demineralization is like removing a few cans here and there, the whole thing is wobbly but still standing. That's like the white spot--still standing but weak. One can too many gone and the whole thing collapses--ie a cavity in our analogy. Fluoride is like putting in a can of orange crush in the holes to keep the stack of cans from falling--it strengthens things. Still, even with fluoride and good brushing things can get worse to the point that fillings etc, may be needed. Just don't get carried away with the fluoride--swallowing too much is not advisable. Good luck. Thanks for replying to my previous post regarding twin boy (currently 14 months) and a top front tooth that seemed to be growing slower than the other. We have since noticed that the front right tooth started growing higher in the gum than the left so it appears that this tooth was growing slower but infact is set higher in the gum and there is a difference in the length between the two front teeth now. Is there a chance that the same thing will happen with the permanent teeth? and that the same front right tooth will grow higher up in the gum than the left? and if so can we do anything to prevent this? Habits can move teeth (Pacifiers/thumbs). Still, not a bad idea to check with your Pediatric Dentist. My son is 17 months and he has his 4 top and bottom teeth but he doesn't have his cuspid teeth. Although his molars are coming out top and bottom. Is this normal, because I'm worried. sounds pretty normal to me. cuspids usually come in after the first molars. Sorry for the delay, I've been out of the country. Check out my post on gemination and fusion of teeth. Of course let your pediatric dentist check it out. My son is almost 5 and I have noticed that his teeth seem unusually small and far spread apart. I have noticed it before but not really worried about it and now i have begun to worry. I know that they say it is good for there to be alot of space for when the permanent teeth come in but it just doesn't seem quiet right. Is this something that is normal? My son is 14 months old and recently I have noticed his top gums are growing over two of his top teeth. They are very red and swollen. I have brought him to see his Dr. 3 times and finally on the third visit he was put on Augmentin and I was told we would see a difference in 48 hours. After five doses they are not getting any better, I would say they are getting worse. Now his gums are covering almost all of his top four teeth and they are bleeding if touched. Along with all of this he has had a sore on his lips that do not seem to go away. Not sure it the two are linked?? I was wondering if you had any ideas on what is going on with my son? Or have you heard of any such thing? I can't say as I am not his dentist--I do see primary viral infections in one year olds quite often which causes sore areas in gums,palate, tounge and tends to run it's course in about 10-14 days. im just curious why children teeth are whiter than our adult teeth?? They are! Some parents think there is something wrong with the permanent teeth when they come in looking slightly yellower or grayer than the pearly white baby teeth. Why? I do not know other than they have thicker enamel and dentin (the darker dentin tends to shine through more). my five year old daughter just lost her top baby tooth. There is not root attached. Should I be concerned about this? Does not sound unusual, get your dentist to check it out. My 4 year old had dark molars so I took him for his 1st cleaning in April. Was told by family dentist that he had no enamel on his back molars due to high fever and that it appeared he had a cavity. I went to a 2nd dentist for xrays and consultation...he has 5 cavities and yes, no enamel. My son will need silver plated caps on each molar. It was recommended that I take him to a pediatric dentist so that he could be sedated...since the work will be so intensive. What could have possibly caused the enamel to waste away on his back molars only? ...should I have them put a sealant on the other teeth once the molar issue gets fixed. Can you advise as to the different types of medicine used for sedation of a 4 yr. old? is this the laughing gas? Also, what could I do to prevent further loss of enamel on my child's teeth. We have well water at home (obviously no flouride in water supply) but his daily vitamins have flouride to compensate. Finally, my 7 yr. had a great check up. When I asked about sealant for her teeth the dentist said it wasn't necessary...why wouldn't a Dr. recommend the sealant? is it her age? I'm on vacation right now so I cannot answer in detail, but please check out my posts on sedative medications used in pediatric dentistry, sealants, and much more. All the posts are listed on the right side over there--a lot so it may take some looking good luck. I have a 2 1/2 almost 3 in Nov. A few months ago I notice that her teeth were starting to get a white ring on top of where the gums are. I took her to the dentist to get her teeth cleaned,but they said she was fine and told me that it was normal. Well I brushed her teeth today and noticed that the white ring was brushing off and leaving a gap in her teeth. I am now scared, and I dont know what to do about it now. What do I do? Is she to young to get it fixed like the doctor said, and are they going to have to put her under? This is now happening to her bottom teeth too. While decalcifications are often the beginning signs of decay-once it crumbles (decays-if that is what it is) it would need to be restored. I would get a pediatric dentist to take a look again, things can happen fast in kids--a pediatric dentist will know how best to care for preschoolers..
hi my son is 12yrs.. and currently had 4 baby teeth still... molars... At last week check up.. the dentist told me that he is late in loosing his molars,,, and has a cavity in one of them... he wants to fill it,,, is it worth it as he is in no pain,,, and its loose,,, ??? not uncommon for kids to have baby molars at 12-some stay till 14... I do not fill a tooth if it's about to come out in a few months-each case can be different. According to our dentist, my 7 1/2 year old daughter needs 3 crowns on her primary teeth (2 canines, 1 1st molar). I'm wondering if this is necessary since she got her first teeth at 4 mos. and lost her first ones at 4 years (I believe she has lost a total of 8 so far). Is this a pattern that will continue? If so, should we consider pulling the teeth instead? I would hate to spend all that money for the teeth to fall out within the next year or so. We have already been told that she will need braces in the not too distant future, so is the spacing still a problem? This is not a pediatric dentist, should I consider seeing one for a second opinion? Thank you for your time. An evaluation by a pediatric dentist would be a good idea. Not because this treatment plan is not correct, but I think you would feel more confident that the treatment proposed is the best and most reasonable for your child. Like my post stated, some baby tooth do not fall out till age 12 and their premature loss can cause problems. Hi, I have a 6 year old son who as gone for regular check ups since he was 3. I brush his teeth myself twice a day since before he had teeth. Now he has 3 teeth that have been filled in the last 4 months. 2 of the 3 fillings have fallen out and now they are telling me that they need to pull them because the decay is too bad. I don't understand why his teeth are decaying in this manner. He doesn't drink any pop. He does drink juice, water and milk. My husband also has bad decay on his teeth. I was wondering what could be causing this decay in my son. I admit he does have sweets from time to time but his dental care is regular. None of his teeth are brown or black like some of the pics I've seen about severe decay. I am torn as to what to do. I really don't feel comfortable pulling them is there another solution if the fillings won't stay??? My upper right canine never got pushed out because the permanent tooth that was supposed to replace it was removed by an oral surgeon when I was 14. (I am now 37) Currently I have braces on my upper teeth to fix my lateral incisors which were sticking out. The orthodontist put a bracket on that baby tooth and I am worried that the braces will "work" the baby tooth loose. Could this happen? There is always a risk when moving any teeth, but baby cuspids are pretty sturdy. My six month old has his bottom two teeth...one of the teeth looks like it has a clear grayish part on the top. What could this be? He does not go to sleep with a bottle and I brush his teeth with a baby tooth brush. See your pediatric dentist. I am sure he can help. My grandson is six years old and his two upper front teeth came out in July. How long does it takes for the teeth to grow back. His parents does not take him to the dentist regularly and the last time he went was about two years ago. The dentist said he had 8 cavities. He said to bring him back in 3 months and he would work on two and schedule different appointment to take care of the others. The parents never took him back to take care of the cavities. What can happen when a child have so many cavities and do not see a dentist regularly or brush regularly. I need this to show his parents how important it is to make sure he brush regularly and see a dentist regularly. He complains his back teeth hurts when he eats. His father tells him, don't worry about it, he doesn't need to see a dentist because those are his baby teeth and it will fall out. Could he get gum infection and would this affect his permanent teeth growing in. My son is almost 7 1/2. The beginning of last school year he lost the 4 bottom front teeth. Only two came in in their place. What do I need to do? Thanks! Doesn't sound too weird to me as central incisors come in together--still, see your pediatric dentist. My 5 1/2 daughter has a cavity, they tried to treat it by giving her oral sadation but they could not even get the x-rays done because she was so hysterical. They recommend that they but her to sleep during treatment but it's $500 because it's not covered under our insurance. we don't want to but her to sleep because this year she had her tonsils removed and we feel she's too young to be put to sleep so many times. Can we hold off on getting any treatment? I know it's a difficult situation. It is a generally accepted observation that cavities get worse with time often necessitating increased expense and treatment. Consult with your pediatric dentist for the best options for you. My daughter is six and one of her top front tooth was a bit loose and her grandparents decided to pull it out, this was in Aug. it is now Nov and there is no sign of the permanent growing out yet, is this normaL? how long does it take for them to start growing out? Also the oither top front tooth is loose. It is not hanging out and I don't feel comfortable pulling it but it is now lifted and has turned to the side (it looks weird) should I pull it out or just wait? Normal--I have seen it take up to 6 months for a permanent tooth to come through after a baby tooth falls out. See your dentist if you have questions about your particular case. Hi, I have a perhaps weird idea for fixing up my teeth. I have a small tooth (third from the back) that my dentist said is probably a baby tooth. It's decayed and he said it may have to be removed eventually. At the same time, I can feel a wisdom tooth coming out at the back (2 molars away). Could I actually remove the decayed baby tooth to make space for the wisdom tooth, and then keep the wisdom tooth? I've heard teeth move around when there's space, so will the 2 molars move forward when the baby tooth is removed, so there's enough space for the wisdom tooth? Thanks! There are a lot of options available for patients with retained baby teeth with no permanant tooth underntath. In growing children we can often move things around orthodontically very easily. In adults you can often still do orthodontic treatment to move teeth, but each case is different. Many times third molars (wisdom teeth ) do nto have enough romm, or for whatever reason need to be removed. I have has a few cases where a wisdom tooth was allowed to erupt into the position of a missing permanent second molar, but they don't really move that far on their own. My 5 11/12 daughter has 2 front baby teeth that already comes out through her upper front gum. It looks like the root of these two front baby teeth are coming off backward instead of downward. one of her permanent tooth at fron has already come out but the baby tooh is there and not loose. but the other one looks like its having a hard time to psh the other tooth. Is this normal for her? Renee, Sounds like you may need your pediatric dentist to take a look. Sometimes permanent teeth do not come in as they should. I have some very specific questions regarding using serial radiographs as a criteria for deciduous tooth removal. My 3 year old son had a trauma to his upper right incisor about 4 months ago (older brother collision). The initial trauma subluxated the tooth slightly but his thumb sucking has seemed to move the tooth gradually back to its original position. The tooth is not discolored or painful. His dentist has followed the tooth with serial radiographs at the time of the injury, 1 month and 3 months post injury to evaluate if extraction of the tooth is recommended. It is his opinion that the radiographs show inflammation which could damage the underlying adult tooth if the deciduous tooth is not removed. The root is still present and there is some bony remodeling of the root, changes in the periodontal ligament "space" etc. What I cannot understand is how is this process any different from normal tooth resorption? Do you have an opinion of the weight clinical signs (of which my son has none) vs radiographic information should play in determining the removal of a deciduous tooth? With all I have read about needing space holders etc I am not too excited about doing something that may not be absolutely necessary. I have found your website very helpful in describing many pediatric dental issues and with three active litle boys in my family I will likely be dealing with lots of them! It can be a difficult decision, but usually the pediatric dentist has seen this kind of thing many times. I cannot say what you should decide on your specific case as each child/tooth/trauma is different. As far as if the tooth is removed do you need a space maintainer, well you can read my posts on that, basically no, not in the front, yes if it was a back tooth IMOP. Some people do a "fake" tooth in the front just for looks. An abscessed tooth can adversly affect the developing permanent tooth. If it really is abscessed, I almost always recommend removal. There are a few cases where, if it looks bad but we are not sure if it is abscessed, we do a baby tooth root canal, but that is not always effective. There are several patients where I am "watching" the traumatized tooth. We usually do not recommend anything unless it shows signs or symtoms of a problem. is it possible for kids to have loose tooth at the age of three and hald? My son has a loose tooth. It is possible, sometimes because of trauma (they damaged it some way at some time or another). Mostly that 3-1/2 yrs would be a little early. I have seen four year olds having a loose tooth normally...that is the lower front two incisors. Kids that get baby teeth very early are prone to loose them early. I'd get it looked at to make sure it is a normal process. Rare cases of more severe pathology have been reported in such unusual cases-- still, most cases I see would be early normal eruption/exfoliation. I have a question. My daughter who is just a year old has 4 teeth. Her two top teeth are decaying. I wanted to know if there was anything I could do to maybe reverse it? Please help.. Thanks. Dental Caries (decay) once it starts cannot be reversed. In the initial stages when a spot is only decalcified, sort of a chalky appearance but no hole there and not to the inner dentin layer, fluoride can help arrest and even reverse the process--this is more likely to work in pernanent teeth as baby tooth enamel is so thin. Otherwise, a dental restoration is the best way to stop the decay. I saw about four or five preschoolers yesterday as new patients that had decay. Good luck. My 4 1/2 year old had a baby root canal on one side of his lower quadrant and he got the silver crown. they said that they need to do the other side as well and then his uppers need fillings. Are the silver crowns the ONLY option for kids? I hate it and am really upset by the appearance. Even though you cannot really see it unless he smiles really wide, it still bothers me so much to see it at all. I read on the internet about Nu Smile which are natural tooth colored crowns for children. Do you know anything about this and is it something you recommend? If he is put to sleep can the remaining treatments be done in one visit? First, we see many kids who have so many treatment needs that the best way to accomplish the treatment is under general anesthesia (see my posts on sedation and general anesthesia). Also, read my posts on white crowns for baby teeth--basically Nusmile are sometimes appropriate for front teeth, but I have never found a "white" crown for back molars that even comes close to being acceptable--the white chips off, you have to do pulpotomies when you would not have to if a stainlness steel crown were used, etc. I know, I wish there was a good esthetic solution, but I have yet to find any of the products out there to be acceptable for back tooth crowns. You need to contact your dentist. He is best to advise you on your child's situation. He want be back in the office till Monday and he has no emergency number. There is always the hospital emergency room if there is a severe concern, otherwise, most dental conditions will hold a few days. Unfortunately, your dentist seems to have not made arrangements for "emergencies." Most pediatric dentists have after hours contacts for traumas, etc. See my other posts too. My daughter is almost 3. She did not get her first tooth until she was 15 months old. Now, she is still missing her top lateral incisor teeth. Should I be worried that they are not there? If they are not there what needs to be done? Often teeth are just slow comming in. Other times they are missing just because they never formed. Sort of like a rose bush where one flower just doesn't bud into a full fower. There can be other pathological things that could be going on as well that need to be examined. So, I would advise getting a pediatric dentist to take a look. I was told a few weeks ago my 8 year old has 3 cavities in the back. This was her first visit to the dentist. The Dr. said he needs to put filling in these teeth. I wanted to know if this is a good idea knowing that they are baby teeth and new ones will come in soon. Thank you so much for your time and help. I have a 10month old with 6 teeth. 2 on the bottom and 4 on top. However, we noticed a 7th but it's behind the 2 centre front teeth and it looks like it's coming out sideways and looks like shark teeth as it's pointy. It has not fully protruded yet. Is this something I need to worry about? I don't think the tooth is adult teeth as he is only 10 months. Is there anything I can do about this? Richard, I woud have a Pediatric Dentist take a look. I cannot tell (over the internet) but does not sound normal. There are now almost 100 comments on this popular blog post, so I am closing this particular post to new comments. I think you can find the gist of the subject by reading all that is here--and there is a lot here. There is also many other related topics and comnversations about cavities, treatment of young children, sedation, etc., etc. Just see the side bar and the topic index over there on the right side of any post or the main page. Thank You!